Ferdinand II (10 March 1452 – 23 January 1516), called the Catholic, was King of Sicily from 1468 and King of Aragón from 1479 until his death. As a consequence of his marriage to Isabella I, he was King of Castile jure uxoris as Ferdinand V from 1474 until her death in 1504. He was recognised as regent of Castile for his daughter and heir, Joanna, from 1508 until his own death. In 1504, after a war with France, he became King of Naples as Ferdinand III, reuniting Naples with Sicily permanently and for the first time since 1458. In 1512, he became King of Navarre by conquest. Ferdinand is today best known for his role in inaugurating the discovery of the New World, since he and Isabella sponsored the first voyage of Christopher Columbus in 1492. That year he also fought the final war with Granada which expunged the last Islamic state on Iberian soil, thus bringing to a close the centuries-long Reconquista. At his death he was succeeded by Joanna, who co-ruled with her son, Charles V, over all the Iberian kingdoms save Portugal. The completion of the Reconquista was not the only significant act performed by Ferdinand and Isabella in that year. In March 1492, the monarchs issued the Edict of Expulsion of the Jews, also called the Alhambra Decree, a document which ordered all Jews either to be baptised and convert to Christianity or to leave the country. That document was signed with the defeated Moorish Emir of Granada Muhammad XII, who had bargained for the Muslims of Spain to be left alone. It allowed Mudéjar Moors (Islamic) and converso Marrano Jews to stay, while expelling all unconverted Jews from Castile and Aragon (most Jews either converted or moved to Islamic lands of North Africa and the Ottoman Empire). 1492 was also the year in which the monarchs commissioned Christopher Columbus to find a westward maritime route for access to Asia, which resulted in the Spanish arrival in the Americas. Ferdinand violated the 1492 Alhambra Decree peace treaty in 1502 by dismissing the clearly guaranteed religious freedom for Mudéjar Muslims. Ferdinand forced all Muslims in Castile and Aragon to convert, converso Moriscos, to Catholicism, or else be expelled. Some of the Muslims who remained were mudéjar artisans, who could design and build in the Moorish style. This was also practised by the Spanish inquisitors on the converso Marrano Jewish population of Spain. The main architect behind the Spanish Inquisition was King Ferdinand II, whom was ironically of converso heritage (or perhaps because of it, he may have been embittered by being the great-grandson of Fadrique's mistress). Ferdinand destroyed over ten thousand Arabic manuscripts in Granada alone, burning them. After Isabella I's death in 1504, her kingdom went to their daughter Joanna. Ferdinand II served as the latter's regent during her absence in the Netherlands, ruled by her husband Archduke Philip. 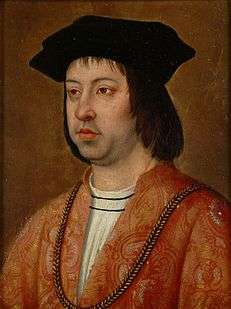 Ferdinand attempted to retain the regency permanently, but was rebuffed by the Castilian nobility and replaced with Joanna's husband, who became Philip I of Castile. After Philip's death in 1506, with Joanna supposedly mentally unstable, and her and Philip's son, the future Emperor Charles V, only six years old, Ferdinand resumed the regency, ruling through Francisco Jiménez de Cisneros, the Chancellor of the Kingdom. Charles I (to later become Holy Roman Emperor Charles V) became the King of Aragon in 1516, with his mother Joanna as Queen in name, upon Ferdinand's death. Ferdinand disagreed with the policies and foreignness of Philip I. Ferdinand remarried to Germaine of Foix on October 19, 1505 in Blois, Kingdom of France, the granddaughter of his half-sister Queen Eleanor of Navarre and niece of Louis XII of France. His hope to father a new heir of Aragon, separating it from Castile, was not realised. 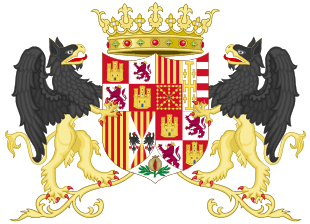 It would have denied his son-in-law Philip I, and his grandson Charles I, from inheriting the crown and governance of Aragon. A son, John, Prince of Girona, was born on May 3, 1509, but died within hours. 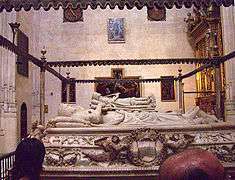 John was buried in the convent of Saint Paul in Valladolid, Kingdom of Castile and Leon, and later transferred to Poblet Monastery, Vimbodí i Poblet, Catalonia, Kingdom of Aragon, traditional burial site of the kings of Aragon. 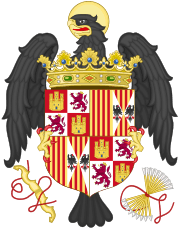 Ferdinand also had children from his mistress, Aldonza Ruiz de Iborre y Alemany of Cervera. He had a son, Alonso de Aragón (born in 1469), who later became Archbishop of Saragossa, and a daughter Joanna (born in 1471), who married Bernardino Fernández de Velasco, 1st Duke of Frías. 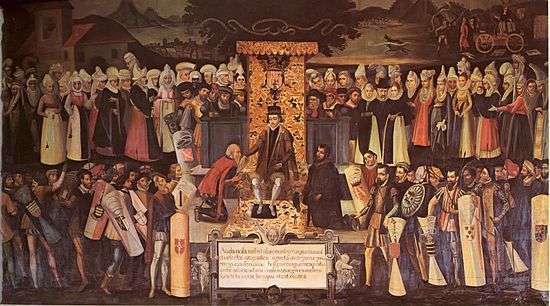 In the 16th century his son Alonso de Aragón, found a hidden study under Ferdinand's palace containing over 400 documents written by Ferdinand. In these documents Ferdinand explained his general outlook on political power, and his true goals behind all his decisions during life as the King of Castile and Aragon. Also through these documents, Ferdinand wrote that "during times of very complicated decision making he blindfolded himself to concentrate on the true matter of a situation, and not let other things 'cloud his judgment'." 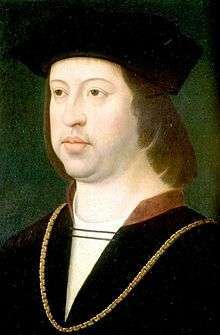 Ferdinand II died on January 23, 1516 in Madrigalejo, Extremadura, Kingdom of Castile and Leon. He is entombed at Capilla Real, Granada, Kingdom of Castile and Leon. Isabella I, Joanna I, and Philip I are beside him there. 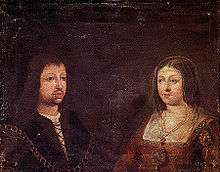 Ferdinand and Isabella established a highly effective sovereignty under equal terms. They utilised a prenuptial agreement to lay down their terms. 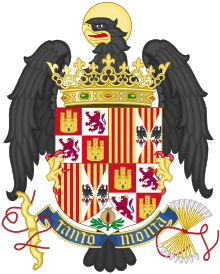 During their reign they supported each other effectively in accordance to his joint motto of equality: "Tanto monta (or monta tanto), Isabel como Fernando", ("They amount to the same, Isabel and Ferdinand"). Isabella and Ferdinand's achievements were remarkable: Spain was united, or at least more united than it ever was, the crown power was centralised, at least in name, the reconquista was successfully concluded, the groundwork for the most dominant military machine of the next century and a half was laid, a legal framework was created, the church reformed. Even without the benefit of the American expansion, Spain would have been a major European power. Columbus' discovery set the country on the course for the first modern world power. Ferdinand's grandson and successor Charles, was to inherit not only the Spanish lands of his maternal grandparents, but the Habsburg and Burgundian lands of his paternal family, which would make his heirs the most powerful rulers on the continent and, with the discoveries and conquests in the Americas and elsewhere, of the first truly global Empire. Isabella (1470–1498), Princess of Asturias (1497–1498). She married first Prince Afonso, Prince of Portugal, but after his death she married his cousin Prince Manuel, the future King Emanuel I of Portugal. She died in childbirth delivering her son Miguel da Paz (Michael of Peace), Crown Prince of both Portugal and Spain who, in turn, died in infancy. John (1478–1497), Prince of Asturias (1478–1497). He married Margaret of Habsburg (daughter of King Maximilian I). He died of tuberculosis and his posthumous child with Margaret was stillborn. Joanna I (1479–1555), Princess of Asturias (1500–1504), Queen of Castile (1504–1555), Queen of Aragon (1516–1555). She married Philip I (Philip the handsome) (son of the Emperor Maximilian I); and was the mother of King Charles I of Spain (also known as Charles V as Holy Roman Emperor). Ferdinand made her out to be mentally unstable and she was incarcerated by her father, and then by her son, in Tordesillas for over 50 years. 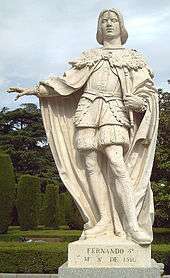 Her grandson, Philip II of Spain, was crowned in 1556. Alonso de Aragón (1470 – 1520). Archbishop of Zaragoza and Viceroy of Aragon. Juana de Aragón (1471 – bef. 1522). She married Bernardino Fernández de Velasco, 1st Duke of Frías. María Esperanza de Aragón (1477 – 1543). Abbess of Santa María la Real de Las Huelgas. María Blanca de Aragón (1483 – 1550). Nun at Madrigal de las Altas Torres. 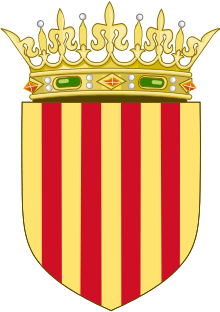 ↑ Aragónese crown included the kingdoms of Majorca, Sardinia and Valencia, as well as the Principality of Catalonia. ↑ "Re: Jewish Grandmother of Ferdinand?"